Take yourself back to March, 2011 and the release of IE9. Microsoft says they will support the silly and pointless Do Not Track header, but they also announce support for Tracking Protection Lists, which are pretty much the same thing. Not exactly the same thing, but they have the same goal and share much of the same methodology. 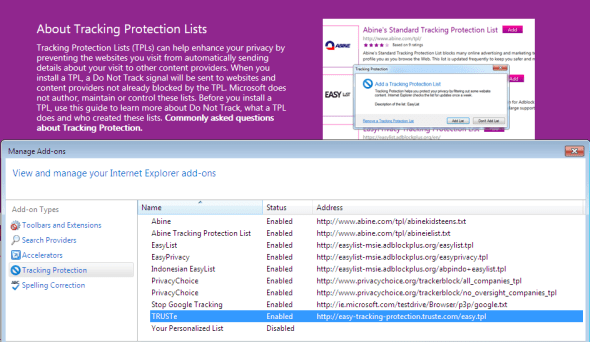 In IE9 or IE10 (or, presumably, IE11) hit the gear icon then “Safety” and then “Tracking Protection…”. Like The Cookie Clearinghouse, TPLs can also whitelist a domain (with a “+d” instead of “-d”). There are several in the TRUSTe list. Unlike TPLs, the Cookie Clearinghouse has no implementation definition at all. The group is leaving all that up to the browser vendors. But TPL would be one way to do it, which means that Internet Explorer is pretty much set up for it already. I spoke to Andy Sudbury, Chief Technical Officer at Abine, a privacy services company that was one of the first out of the gate with a TPL. Sudbury is certainly right about this. The Stanford people are obviously smart and true believers and it’s entirely possible something useful could come out of it. “Unfortunately, cookies are just one part of the privacy problem and, in fact, declining part of it.” As Sudbury explains, cookies – especially 3rd party tracking cookies – have such high profile and such a bad name, they’re starting to get blocked more broadly – such as Safari’s 3rd party cookie blocking behavior, soon to be followed by Mozilla, and hopefully even more so through implementations of the Cookie Clearinghouse’s lists. Even Tony Soprano was scared of cookies. Tracking nowadays goes far beyond cookies and extricating yourself from it is no simple matter. For instance, you may not want all the implications of every “Like” button you click on Facebook, but does that mean you should block all requests to facebook.com? There are products and services which attempt to block tracking in a more comprehensive and intelligent way, including Abine’s own DoNotTrackMe. Now of course it’s fair to say that nothing became of TPLs when Microsoft released them. They may be an excellent technique, but nobody would know about it because Microsoft barely gets any interest from the press for Internet Explorer in spite of retaining huge market share. It’s certainly far more comprehensive and effective than the Do Not Track HTTP header, the main focus of the W3C Tracking Protection Working Group. That was a simple request by the user’s browser to the web site not to track. The working group has been working on this seemingly simple task for over 2 years and is on the verge of giving up. This is why you’re seeing proposals like Cookie Clearinghouse now. It’s balkanization. There is one major problem that the Cookie Clearinghouse just glosses over: The system requires maintenance of the white and blacklists. There is a section on their web page where they indicate that they will be taking this function on for themselves and providing for ad networks to file challenges and I have the feeling that they don’t know what they’re getting themselves into. The advertisers will be all over them like flies on….well, you know. This article also appears on Betanews.